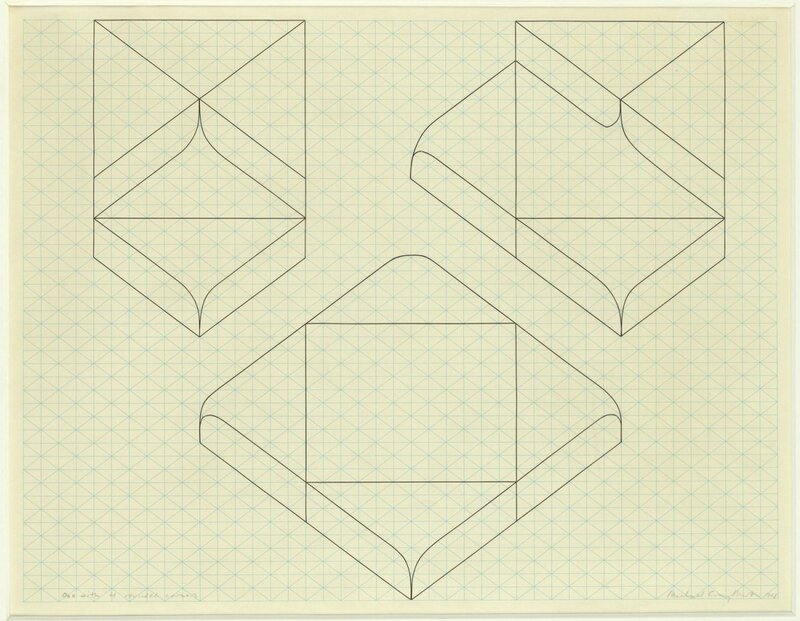 Box with Four Rounded Corners is one of a series of studies for the sculpture Formica Box, 1968, (formica on plywood, 121.9 by 121.9 by 61cm), which Michael Craig-Martin made two years after he had graduated from Yale University and moved back to Britain from the United States. Many similar drawings and their related sculptures were exhibited at Craig-Martin’s first solo exhibition at the influential Rowan Gallery in 1969 and it was from this exhibition that the Tate Gallery acquired Four Identical Boxes with Lids Reversed, 1969 and the associated drawing. The drawings from this series themselves have a sculptural sensibility, here Craig-Martin has used tape, rather than drawing media, to delineate the edges of the forms and his use of isometric plotting paper foregrounds that this is a proposal for an object. The aesthetic simplicity of the image and the spatial arrangement of three similar motifs in one composition, prefigure the line drawings of household objects which Craig-Martin began in the 1980s and for which he is now best known. Over the past thirty years he has created his own ‘dictionary of drawings’, honing a single line drawing to represent each category of man-made object - phone, umbrella, shoe, fork - which he employs over and over again in different works of art.